Stoney Creek Reservoir Dam Rehabilitation — Morgan Corp. Rehabilitation and reconstruction of the existing chute spillway including new sidewalls, parapet walls, cut-off walls, spillway crest, and chute slab overlay (approximately 2,900 CY of reinforced concrete); overtopping protection on the downstream side of the existing dam embankment consisting of 10,000 CY of roller-compacted concrete; sand blanket drain; stone trench drains including 2,500 LF of PVC perforated and solid pipe; 20,000 CY of excavation and backfill; Rip Rap channels; water line relocation; sheet piling; pressure injected grout; piezometers. This dam is classified as Category I High Hazard. 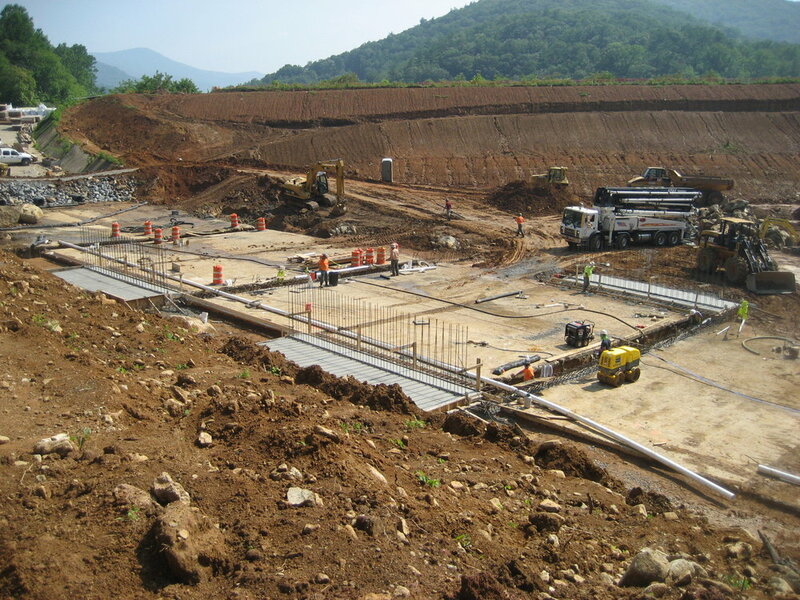 Control of water was handled by drawing down the existing lake, cofferdam installation at the crest of the existing spillway and localized pumping to mitigate ground water. A Rapidmix 600 pugmill mixer was used to mix the RCC. The RCC was transported via articulated dump trucks discharging into a Gomaco material transfer devise, which fed a stacker conveyor belt. A telescoping crane was used to receive the RCC and conveying it to the final placement location.